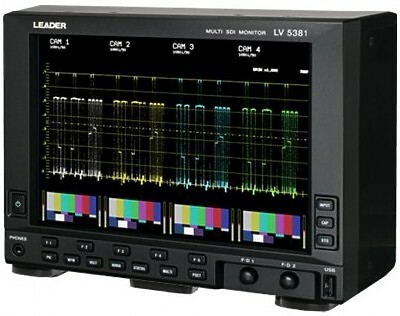 The LV 5380 is a multi-SDI monitor equipped with a precision video signal waveform and vectorscope display via a high-fidelity TFT LCD that produces high-quality picture displays. It also offers an embedded audio signal display featuring Lissajous and level-meter configurations. Additional features include simultaneous display of two SDI signals, screen capture to USB memory, and on-picture gamut error monitoring. All these features are integrated into a thin, light instrument that allows it to be used in any video production or monitoring application.